The polar vortex in the Midwest and Northeast United States will deliver record low temperatures not seen in these regions for decades. Building operators must ensure that all equipment installed to protect mechanical systems is functioning properly. In the long term, watching out for these dangers can reduce and prevent costly repairs following the polar vortex. 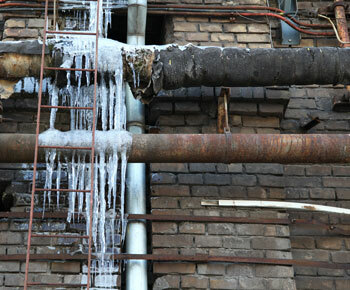 When pipes freeze, they tend to burst, which could amount to tens of thousands of dollars in water damage and repairs. Before conditions become dangerously cold, it is crucial to understand freeze prevention methods. While cities like New York can expect to see zero-degree temperatures, the Chicago metropolitan area could see temperatures as low as –50°F. For the average building in New York, if the temperature drops to 9°F, it could take just over an hour for exposed insulated pipes to begin to freeze. In Chicago, at -50°F, exposed pipes would reach freezing temperatures in half that amount of time. To provide adequate heat, it is advisable for building operators to set temperatures no lower than 68°F for conditioned areas and 50°F in mechanical areas in accordance with state and local building codes throughout the United States. It is also important to monitor cooling towers and water towers during cold weather events. Most cooling tower manufactures provide ways to properly operate the tower during freezing temperatures. 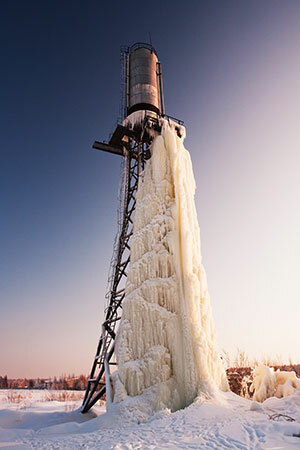 Components, such as the Fill and Drift Eliminator, can be prone to ice formation on the surface, which impacts the efficiency and overall service life of the cooling tower. When the Fill wears out, it will need to be repacked, which could cost up to $2.4 million dollars per tower. Furthermore, if the cooling tower becomes damaged and inoperable, anything on the interior of building that needs to be cooled to a certain temperature could be exposed to potential damages as well. Cooling towers containing heat trace should be adjusted accordingly to compensate for the additional heat loss during this time to avoid any ice formation and to increase the longevity of the cooling tower. For buildings containing oil-tank heating systems, it’s imperative to keep the oil at an appropriate temperature to maintain efficiency, to prevent possible break downs, and to avoid gelling. Like water, when diesel fuel is chilled to 16°F it can start to freeze, or as commonly used, “gel.” When pipes gel, it can cause clogs in fuel lines and filters which results in less heating oil going to the oil burner.